The Spinal Ligament Injury Is the #1 cause of pain, disability and expense in the market today. To reduce your risk, you need to work with a doctor that fully understands this condition. The reason for this is because spinal ligament injuries are notorious for causing chronic pain. Chronic pain in America is expensive to medically manage–as medicine is not great at managing chronic musculoskeletal problems. Because of this, many Americans turn to expensive and addictive drugs or invasive surgical procedures. Recent research reveals that many people emerge with chronic pain from the most common injury mechanism, the automobile collision. One of the longest studies ever performed on whiplash–injured patients looked at the health status of those same patient 17 years after the injury. 55% of the patients still suffered from pain caused by the original trauma. When a doctor does not understand, or cannot find a physical cause (correct diagnosis), or the symptoms do not add up to what they’re used to seeing; the doctor may begin to believe that the condition is just in the patient’s head. In the previous article I listed the symptoms that are commonly associated with spinal ligament injury. Some doctors do not understand the common symptoms of these conditions, which makes it hard to get an accurate diagnosis. Of course, the diagnosis is just working backwards from the patient’s presenting symptoms to finding the original physical cause. Mary goes to her regular medical doctor after being involved in an automobile collision last week. When she sits down with her doctor she reports that her left ear has some pain in it. She has some ringing in her ears that is more pronounced at night, and she seems to be forgetting things. She has some difficulty concentrating and she has some neck pain that comes and goes. She has noticed that she is getting headaches that were not present prior to the automobile collision. The first thing that the doctor may be thinking is that Mary is too sensitive and this may all be in her head. The doctor may not be aware of the symptoms associated with a spinal ligament injury and does not realize that these injuries can usually be treated easily and effectively if caught early. Where do you think this line of questions is going? Mary leaves the doctor’s office with a prescription of some form of psychiatric drug. This is a wrong diagnosis–and it happens all the time. Moria Dolan, MD, in her book, No-Nonsense Guide to Psychiatric Drugs informs patients about these drugs. You can purchase the book through Amazon. It is an informative read. A study found that essentially 100% of those who are suffering from chronic pain caused by a whiplash injury would have an abnormal psychological profile with standard assessments. The only way to resolve the abnormal psychological profile is to successfully treat the chronic spinal pain; psychotherapy was not able to improve the abnormal psychological profile nor was it able to improve the patient’s chronic pain. Your pain is not being caused by the abnormal psychological profile; rather the pain is causing the abnormal psychological profile. If your doctor seems to be indicating that it is “all in your head,” then it is high time to get a second opinion or change doctors. The physical issues of a spinal ligament injury are most heavily documented in cases of whiplash; although, a ligament injury can occur from many mechanisms in many different environments: work, home, sports, etc. The mechanisms of injury from automobile collisions are very well studied because we carry insurance to cover these injuries. As listed in the study, nearly 4,000,000 people are injured in automobile collisions. From the research above, over 2 million of you are going to be chronically suffering with the same problem 17 years later. This means that the pain is now classified as chronic, which is defined as: any condition that persists for more than 3 months. To be clear, this means that over 2 million people develop chronic conditions from this one mechanism every year! Injury is a primary cause of chronic pain, and chronic pain is a serious problem today. According to the National Institute of Health Report, in 2014 over 100 million American adults suffered from chronic pain, and according to the Mayday Fund over 20% of adolescents suffer from chronic pain. There is no bigger health problem in the world today than chronic pain. To avoid being in the 55% with years of pain you must find a doctor that can help you as quickly as possible. Injury is the most common initiating event to the disease: Chronic pain. If you want to look further at studies that show just how poor doctors results are with patients that have been treated for these injuries, please watch Whiplash Statistics Don’t Lie on YouTube. This was published by one of the leading Spinal ligament injury testing companies in the United States called Spinal Kinetics. This company is the leader in testing procedures that assist doctors in accurately determining the severity and location spinal ligament damage. Now let’s talk about cost–your cost–and why it is so necessary to stay out of the money pit caused by chronic pain. Chronic pain and its expenses can leave you quite poor! Medical treatment for chronic low back pain is estimated to cost $9000-$19,000 per patient annually, and interventional treatment cost a minimum $13 billion in 1990. Additional cost is associated with loss from work due to low back pain. Low back pain is the most common cause for chronic permanent impairment in United States for adults under the age of 65 and the most common cause of activity limitations in persons under the age of 45. It is important to choose your doctor wisely. Your health and future finances may depend on it. What is a diagnosis? Diagnosis is the identification of the nature of an illness or other problem by examining the symptoms. Something that is physically abnormal is now causing the symptoms. The nature of the condition is what you always physically see with it. With Hepatitis C for example, there are things that always accompany it physically, such as antibodies to the hepatitis C virus circulating in your blood. These antibodies are the physical markers that are found to make the diagnosis. These antibodies are the physical biomarkers (a physical, measurable, bodily phenomenon) that lead to the correct diagnosis. With moderate to severe spinal ligament injuries the one thing that is always present physically is excessive joint motion. The joint moves too much; it can be unstable and cause pain. It can cause any other problems or symptoms that were previously listed above. This is easy to diagnose with a simple set of x-rays, when the doctor understands what he or she is looking for. Now let’s see what happens when a condition is not diagnosed properly. When a healthcare provider considers a patient’s symptoms of illness or injury, reviews the evidence, but arrives at the wrong conclusion about the name or the source of that illness or injury, a misdiagnosis results. If the wrong name is given to an illness or injury, then the treatment recommendations can also be wrong, resulting in further illness or debilitation. The treatment the patient really needs, which would result from a correct diagnosis is delayed, or never takes place. It is obvious that when a condition goes undiagnosed the patient suffers, in some cases permanently. The reason that spinal ligament injuries are the number one cause of pain and disability is that too few doctors know how to properly diagnose them. The longer the ligament injury goes undiagnosed and untreated the higher the risk that the symptoms will never fully go away. When ligaments are injured they swell and the swelling causes pressure on the nerve. It is necessary to address this sooner rather than late. Finding a doctor that can quickly diagnose this accurately and who also knows how to treat it is imperative. Spinal ligaments keep your spinal bones in line during use, then you can x-ray those parts while you are using them to see if alignment is being maintained. From these images (x-rays) we can accurately measure your spinal alignment patterns and look for the excessive motion, which is the nature of this type of injury. When a force suddenly overwhelms the spinal joints, and forces them out of alignment, the ligaments are over stretched or torn, leaving the joints loose or lax. The mechanical receptors that communicate with the muscles for support turnoff and the pain receptors can be turned on. This injury is most commonly called a sprain. When the force from an automobile collision does damage to the spinal ligaments they are no longer able to hold the spine in alignment. Spinal ligaments hold vertebra together and keep the joints aligned. When they are damaged, they cannot maintain alignment and the joint will show excessive motion in 1 of 2 forms: a “back and forth” motion called excessive translation motion or bending motion that causes excessive joint angulation. This is generally not diagnosable on an MRI; it is diagnosed with a simple set of special x-rays called stress x-rays, along with a sophisticated measurement analysis called Computerized Radiographic Mensuration Analysis or CRMA for short. CRMA is a specialized technology of spinal x-ray, which will allow the doctor to accurately measure the intersegmental motion patterns in your neck and lower back and allow the doctor to determine the most damaged units on the excessive motion patterns. The location and determination of the spinal sprain injury is determined by the amount of abnormal excessive motion in the individual vertebral motion units. Excessive spinal motion is not found on MRI. An MRI is a test to determine if you have any disc injury, independent of an excessive motion study like x-ray and CRMA. The disc is a spinal ligament and is one of the ten total ligaments that hold your vertebra together. In the spine, it is reported that the total number of specialized ligaments is about 220. These ligaments hold the spine and in perfect alignment and directly communicate information to 120 specialized muscles that allow you to use your spine without pain. Of these 220 ligaments, 23 are called disc, which means that the disc represents less than 15% of the ligaments in the human spine. An MRI in general study of the disc and therefore has some extreme limitations in a spinal ligament injury analysis. In fact, too many doctors today think that if you have a negative MRI you do not have spinal ligament injury but nothing could be further from the truth. Ligament injuries cause excessive motion, but excessive motion is not tested with an MRI. 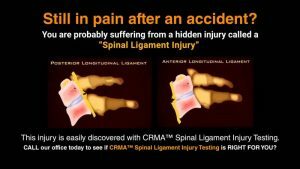 Getting any spinal ligament injury accurately and fully diagnosed is the first step to recovery and it is the most important step when you have this type of injury. Doctor, could I have had an injury to my spinal ligaments? Ask how they know that without a CRMA. Can spinal ligament injuries cause patients significant, long-term problems if they go undiagnosed? See if they recognized the list of symptoms above that are associated with this condition. How do you, or your clinic, accurately diagnosis condition? They should answer that they do and intersegmental motion study with special x-rays and a CRMA procedure, followed by an MRI if they feel it is necessary. Your health this too important to turn over to a doctor that is unfamiliar with the conditions that you may have. Special thanks to Jeffery A. Cronk DC, JD, CEO of American Spinal Injury and Impairment Consultants. Americas leading expert in spinal ligament injuries.